If you live in San Francisco, you can’t afford to miss this FREE event. Over 100 pieces will go on display at White Walls in a timely new show titled “The Duality of Humanity.” The show marks an evolution for the artist, whose unique form of reverse propaganda emerged from the spirit of the punk movement. With this show, Shepard touches upon, but also goes beyond the “calls to action” against mindless consumerism and war evidenced in previous shows like Nineteeneightyfouria, E Pluribus Venom and Imperfect Union. The difference between this show and the previous ones is that now the optimism of a potential Obama presidency is in the mix. His recent work reflects his own personal shift towards a new optimism, a direct result of his involvement with, and inspiration by, the powerful political ideals of Barack Obama. The title of the show, “The Duality of Humanity,” is inspired by the peace-sign wearing US soldier in Vietnam, “Joker,” in Stanley Kubrick’s Full Metal Jacket. Fairey sees a strong parallel between the Vietnam war and the Iraq war. this show addresses the human struggle between good and bad, hope and fear. 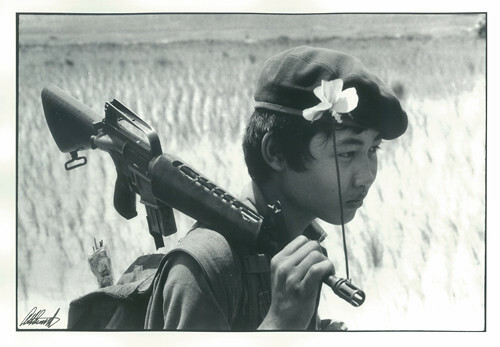 One of the show’s central pieces is a child with a gun in his hand and a flower in his hat. 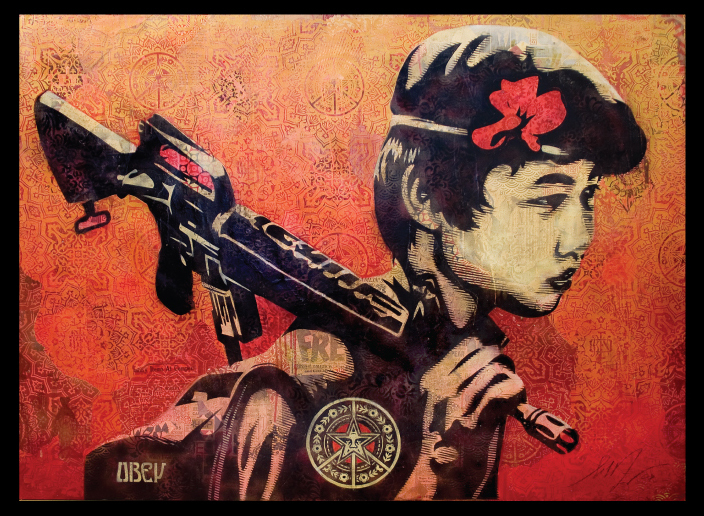 The theme of soldiers and weapons bearing peace signs, or peace signs comprised of military effects, runs through many pieces in the show. Environmental themes also appear in some pieces, illustrating the tenuous balance between our dangerously uncontrolled consumption of non-renewable resources, and our well intentioned eco-concerns. Suffering and hope are seamlessly merged in a visual mash-up that defies expectations and easy answers. Shepard was recently presented with the opportunity to illustrate some incredible photographs taken by photojournalist Al Rockoff. The images that were drawn to Shepard fit exactly with the current times and express same complex emotions many people felt during the Vietnam War and feel today with war in Iraq. 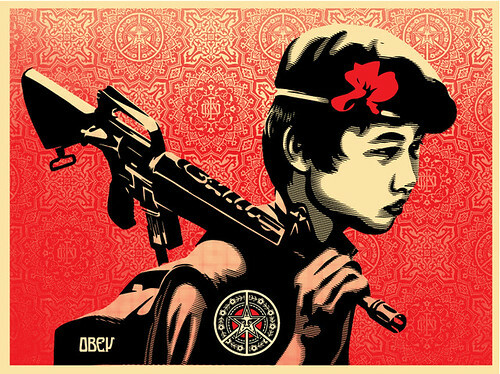 Here is the latest piece of art by Shepard Fairey and his buddies. 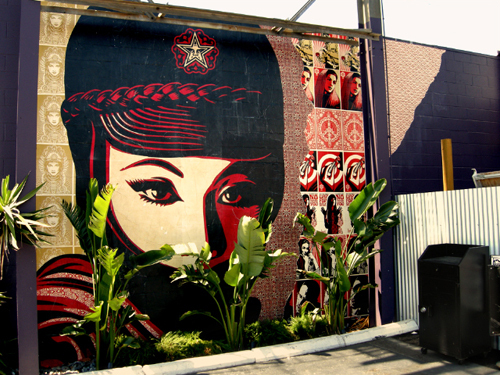 It was done in front of a bar called The Garter in Venice Beach on Lincoln Blvd. This year my friend Sean, ex Obey employee, is getting us in day earlier. Thanks, buddy!